Dr Roger Lavington is dreading his debut performance with the village amateur dramatic society. But real-world drama takes over when Lavington’s neighbour, a reclusive artist, is found murdered in his own sitting room. Also found on the scene are a lady’s glove, a diamond ring, and a mysterious young woman who begs Lavington for his protection. Her safety will depend on her ability to take a role in the forthcoming village play—but is Lavington sheltering a wronged woman or a clever murderess? 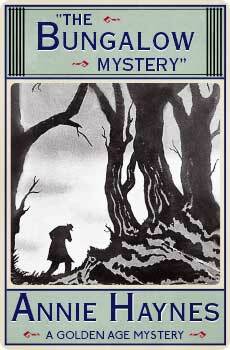 The Bungalow Mystery (1923) was the first of Annie Haynes’s golden age crime novels, and announced a major talent. This new edition, the first in over eighty years, features an introduction by crime fiction historian Curtis Evans.